At Rod Works we offer unique and charming Home Decor at incredible prices. The imaginative way we display our products will get your creativity flowing while our outstanding customer service will work with you one on one to create a one of a kind look for any room in your home. Always looking for the newest ideas in décor, our designers and buyers are always leading us with their vision. You will enjoy the inspiring beauty and top notch quality that is at the very foundation of our products. attention to detail and craftsmanship that makes our products unique and different. Each item has a uniquely distinctive finish. Our products are made to look antique and worn making the finishes imperfect. 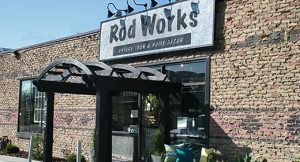 Rod Works started in 1996 to provide an alternative for Home Décor found in the big chain stores. The inspiration came from the owners wanting unique and quality home decor for their own home. Iron decor and curtain rods were the beginning products. Friends and neighbors were soon putting in requests for the unique home decor and a small business was started out of their home. Business grew quickly and the first location of Rod Works was put in Lehi, Utah. Rod Works is no longer just selling iron decor but has expanded to sell all types of exceptional home decor that is stylish and affordable. Customer service will always be what we pride ourselves on. We believe that our store is more about the people than the products. The store provides a personal feel with unique products that you will love to put in your home. We are here to help you decorate and to have fun while doing so.